Join us for this month's Daily Pattern contest! 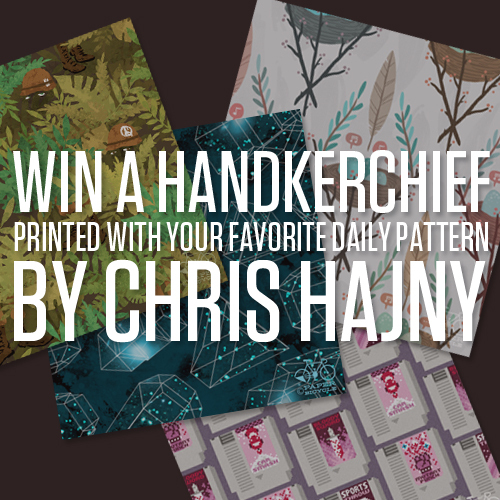 Send your "August" patterns our way and be included in this month's contest to win your choice of Chris Hajny's daily patterns - printed on a handkerchief! Just submit your work at 500 x 500 pixels, in RGB mode, along with your contact information and links to your site/blog. We'll post your work and put you in the running to win this month's giveaway! Don't forget to mail your patterns to Chris(at)paperbicycle(dot)com along with a sentence or two about your pattern! You're welcome to submit up to three patterns for this contest! Take a second and make some patterns! We're excited to see what you make! Any questions? Post below and we'll give you more information! THE LAST DAY TO SUBMIT YOUR PATTERNS WILL BE TUESDAY AUGUST 30TH! We'll be posting all the entries and the winning announcement on Friday September 2nd! Good luck! *Themes and ideas are completely up to you! Just create a pattern that reminds you of the month of August and send it our way! Good luck! We can't wait to see what you make!